It certainly wasn’t a difficult decision to pick LaFarge. In 2010, he had toured England and Scotland for the first time, and had earned a spot in the lineup of the prestigious Newport Folk Festival in Rhode Island that August. LaFarge had also just released his third recording as a leader, “Riverboat Soul” – his first with his backing band, the South City Three (bassist Joey Glynn, guitarist Adam Hoskins and Ryan Koenig on harmonica, washboard and snare). Pokey LaFarge showed up at the Mud House in March for a pop-up concert. As the instrumentation of his band indicates, LaFarge’s music has its roots in traditional blues, country string band sounds, ragtime and popular music from the early to mid 20th century. And his original material is clearly based on those earlier traditional styles. Add his penchant for performing on stage in classic suits from an earlier era, augmented by bowties and an occasional porkpie hat, and it’s a musical and visual approach that may seem contrived. But when you catch LaFarge in concert, it just seems right. 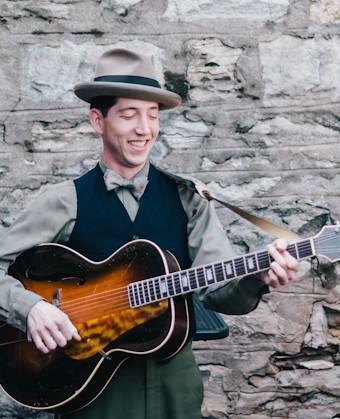 There’s no question that Pokey LaFarge is still a musician to watch more than two years later. But this time, he’s being noticed on a national and international basis – not just by St. Louis music fans. LaFarge will be releasing his first full-length recording for Jack White’s Third Man Records label on June 4. Yes, that’s the same Jack White who founded and led the White Stripes for years, started subsequent bands the Raconteurs and Dead Weather, produced recordings for the likes of Loretta Lynn and Wanda Jackson, hit the charts with his own recording, “Blunderbuss,” and founded his own label, Third Man Records. White happened to hear LaFarge in late 2010 on radio station WSM in Nashville (where White now makes his home), contacted LaFarge on the phone and asked to record him. That initial session produced a single, “Pack It Up,” featuring LaFarge and the South City Three that was released in early 2011. More important, the flip side, “Chittlin’ Cookin’ Time in Cheatham County,” featured LaFarge and the Three with the added musical firepower of a pianist, a drummer, a horn player and a clarinetist. I caught up with LaFarge on the phone in between concerts on the West Coast swing of a tour that will bring him back to St. Louis, then to Nashville on June 1 for another album release concert. From there, LaFarge heads to the Bowery Ballroom in New York on June 4, a homecoming show in his hometown of Bloomington, Ill., on June 8 – and eventually, a tour of Europe in August. The actual beginning for LaFarge’s love for music and appreciation of the roots and tradition of American music started in Bloomington, Ill. LaFarge, whose given name is Andrew Heissler, gained an early interest in traditional music and American history through his parents and extended family. He’s hoping to expand his band even further. As far as his personal musical direction, LaFarge would rather refine what he regards as neglected American musical traditions than cast them aside in search of something completely new. Pokey LaFarge and the South City Three in an NPR Music Tiny Desk Concert in 2011. “I just think that today, Americans tend to take our musical tradition for granted. They turn away from it looking for something new. But when I go to Europe and play music that comes out of American traditional music like blues and bluegrass and the like, those audiences come at it from a different angle. They didn’t grow up with it – they discovered it on their own. So I think they end up appreciating it more, because of that. LaFarge’s connection with Jack White has certainly helped him reach a much larger audience in that effort. “Working with Jack is a good fit,” LaFarge says. “In addition to being a great person to work with musically, being affiliated with his label establishes a certain legitimacy for me. Opening for Jack - somebody that big – and at large venues like Red Rock in Colorado, really helps too. LaFarge is exciting about the upcoming recording release and tour, and he’s especially looking forward to the Casa Loma concert this Friday. For more info, check out Pokey LeFarge’s website: www.pokeylafarge.net.